Mediterraneo Marine Park was the first of its kind when it opened in Malta in early 2000. From being generally an amusement park with a focus on shows that did not always take into account the needs of the animals, the park is now focusing on the care of its host animals. In an inspiring way it presents the dolphins, sea lions and parrots by transferring to the visitors, in particular the young specifics about wildlife and the environment. Gianfranco Selvaggi took the post of general manager last December. His professional experience in eco tourism management and sports education has proved to be an asset when it comes to trying to develop a first knowledge base experience to park visitors. The importance of respecting nature and animals, is a prerequisite for man’s continued existence. During the approximately 25 minute long presentations the animal carers explain the diference between sea lion and seals, dolphins responses to human signs and parrots colourful feathers. Explaining the risks in their open environments, what makes animals feel good and what harms them. From where they get their strength or why they behave as they do. The cooperation between their carers and the animals is highlighted. Many schools undoubtedly have a lot to learn when it comes to pleasurable learning and in fact Mediterraneo has welcomed several visits, allowing pupils for 4 euros to get a chance to learn more about nature and wildlife The park has high running costs especially , electricity . Although it is investigating the possibility to invest in Solar energy to meet its needs. Electricity is something that is very expensive in Malta since Malta lacks lakes and good systems for use of alternative energy sources. Between the three different animal presentations, one can schedule a session with the animal carers and get a closer encounter with the animals. And might even get to swim with a dolphin. The number is limited in line with a policy not to stress animals. It is recommended to pre-book to not be disappointed. Between the one to two daily presentations, the animals have a deserved rest and moment of privacy. That time is not negotiable. We have just taken part of the afternoon dolphin presentation and Kasper, Jesper and Evelina stays behind to learn more about dolphins and of course to get close to them. The dolphins looks curious and let themselves be instructed by them after Michele, the animal carer have taught the youth some dolphin commands. Everything from turning to waving goodbye. As we move towards the output, a dolphin swims curiously beside as far as the lagoon extends. Michele the animal carer is careful not to disturb the dolphins in their rest and takes us some distance away, where he tells us that he has been working for 15 years at the Mediterranoe and studied animal psychology. That he always have loved animals, which he says is a prerequisite for being able to work here. – You have to understand dolphins, feel their character and be able to see what mood they are in, as well as the social fabric of the group. One day, they want to be alone, another day in a group and it can vary who they want to join. My daughter pops up in mind. She has been talking about becoming a marine biologist, but now find that the pace of academic study seems almost insurmountable. She kept a fast pace to sign for its high final grades in high school. When she finaly gets it choose a course with a bit more hands on. Pierre senior animal carer has also worked for 15 years at the Mediterraneo, first with reptiles and the last 12 years with the parrots. He agrees that the studies are good but experience is just as important. – You can get on by pure experience as long as you have a feeling for the animals. Further education can be developed as you go along . All animal carers recommend that you start with a small pet and then move towards larger animals like cats, dogs and horses. Parrot is not recommended. – They are too social, can´t take more than an hour alone. Just like people, they behave like they´re being treated. But unlike humans they never betray you, Michele adds with a smile. ’There is much to learn from animals’. Pierre, which just held the presentation with parrots and green winged Amazon tells that to keep the animals happy and healthy, they must strive to keep the animals’ natural behaviors instead of pressing them in to do stressful acivities. A stressful situation would be being carried around in crowds to be lifted over to an unknown man for photografing. Or constantly force them to do things that don´t make them feel natural. – By respecting the animals, give them proper nutritional food, positive feedback and tenderness, we keep them healthy and satisfied. The oldest parrot at Mediterraneo is 53 years old. There are three pairs of which one pair celebrating 10 years. Parrots without a partner can become very depressed. Mediterraneo cooperates with other parks to find suitable partners. Presents them to each other and hope that chemistry will sue. If it does, they live together for their rest of their lifes. The parrots here love routines, he says and tenderly stresses his hand over the proud Ara. Much of an animal presenters work is about nursing. Parrots for example, need to be feed five times a day. – You simply have to have a passion for animals to be able to work here. Just to build trust, can sometimes take years. Once it´s established, the animals are very dependent on you. Although we are three animal carers here among the parrots, we work almost always no matter if it´s a sunday or Christmas. But of course we do take vacations. The animals at Mediterraneo features just like humans, days when they have no energy or will not be included in any presentation, and we don´t force them to. Just like us, they have their own personality and need encouragement. Parrots for instance like response from the audience. 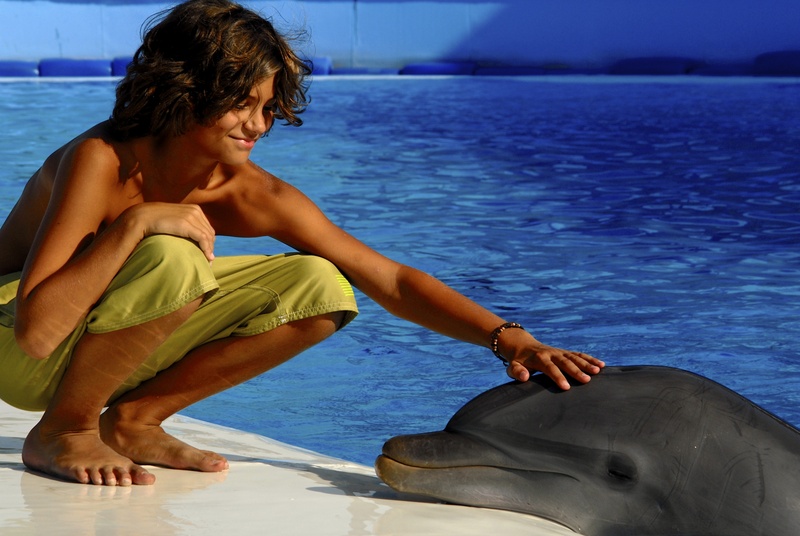 If the animals are happy, visitors are – the philosophy of Mediterraneo’s. Without satisfied visitors the park would not survive. Mediterraneo is a member of EAAM (European Association of Aquatic Mammals) working for marine mammals. Wild, in zoological or as pets.